In Canada, a report by Alberta’s auditor general says the government’s $1.2 billion proposed project to replace the clinical and administrative systems of Alberta Health Services with a single system is not likely to generate the expected $900 million in cost savings because it doesn’t include primary care practices. The project, announced a year ago, would replace 1,300 individual AHS systems. 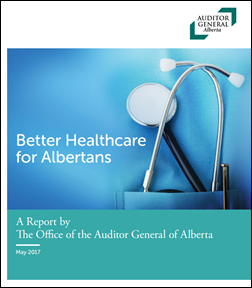 The report notes that Albertans pay the highest healthcare costs of all provinces in Canada, yet the quality and integration recommendations of previous reports have been mostly ignored. 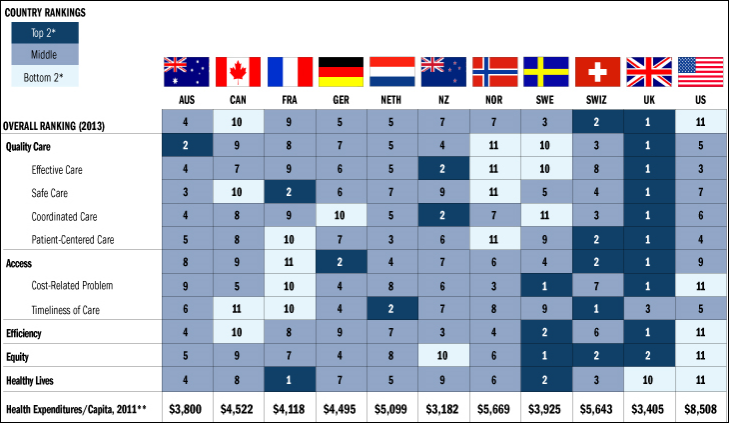 It observes that despite claims of how good healthcare is in Canada, it’s almost as bad as in the US, which finishes dead last among 11 developed countries despite spending far more than any of them. The Auditor General also notes that fee-for-service payments have hampered accountability and integration. It also says that health leader turnover is high due to political cycles, with the average AHS hospital CEO lasting just 1.2 years. Province physicians use at least 12 incompatible EHRs. Canada-wide, 94 percent of hospitals use IT only for administrative tasks. Each branch bank would have its own systems that can’t communicate with other branches. Systems at some branches would be so prone to failure that paper files would be kept ready. Tellers, mortgage officers, and investment specialists wouldn’t be able to access each other’s information. The only access to banking information would be via faxing. Customers would be required each time they visit a branch to fill out the same form asking for name, address, employment information, and financial history. Traveling customers could not withdraw money without opening an account first because the branch would not know who they are. Applying for a mortgage would require visiting each prospective lender individually and completing their proprietary application package. Online banking would not exist. 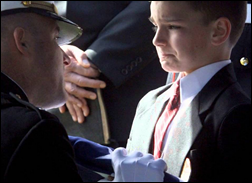 Obtaining an account balance would require making a written request and waiting two weeks for the mailed information to arrive. Bank managers would not have enough information to understand the performance of individual branches. The banks would spend $600 million per year to maintain IT systems but without a plan to standardize them and keep them up to date. From More Math: “Re: CommonWell’s 60,000 documents downloaded. Looking at the latest from Epic’s website, it appears that Care Everywhere hits CommonWell’s lifetime exchange number every 15 minutes. Sounds like Epic is willing and able. Bigger question is whether the CommonWell is drying up.” CommonWell’s March 2017 fact sheet says that 5,100 provider sites have gone live and have generated 85 million queries, although I don’t know how “queries” translates into “documents.” The quoted figure of 60,000 documents retrieved doesn’t indicate the time frame involved, but if that’s all of them since CommonWell’s beginning in 2013, that’s a pretty anemic number. 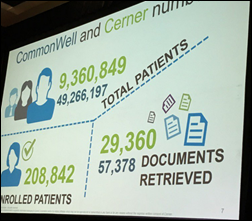 Cerner said in a HIMSS16 presentation that it had 4,000 providers live on CommonWell, which suggests that almost all live CommonWell members are Cerner users; that those providers enrolled only an average of 50 patients each; and that only eight documents per provider were actually retrieved. EHR vendors pay a per-transaction cost to CommonWell and providers don’t really like sharing their patient information with competitors, so there’s not a lot of economic incentive for anyone other than the patient to use CommonWell’s services. Two-thirds of the 247 poll respondents who say they have certification or fellowship credentials don’t list them on their business cards or in their email signatures. KG says credentials should be listed only on CVs other than for practicing clinicians, while Sue says her earned credentials are important to her work and her clients use them as well. John opines that healthcare people deploy “a fruit salad of acronyms” such that the more of them someone lists, the less he believes what they say. New poll to your right or here: to what extent has CommonWell benefited patients since its 2013 founding? 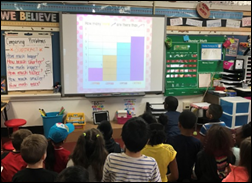 I appreciate your vote and, even more so, your comments explaining it. Gregg Allman died Saturday at 69, leaving zero of the two brothers who founded the Allman Brothers Band in 1969 still alive (also making Cher the ex-wife of two deceased celebrities). I’m not a fan at all of the retired band’s music since I really dislike Southern boogie and country music even when it’s bluesy (other than Lynyrd Skynyrd, anyway), but it’s apparent that hard living took its toll on the founding members — Duane Allman died at 24 in 1971 in a motorcycle accident, bass player Berry Oakley died a year later in the same manner and location, and drummer Butch Trucks killed himself earlier this year. That leaves guitarist Dickey Betts (73) and drummer Jaimoe Johanson (72). I’ve had problems for years where I leave the laptop running and Firefox is open to pages that refresh (like Twitter or news sites) – Firefox gets sluggish and Windows Task Manager shows it eating up a huge amount of memory and CPU, requiring me to hard-cancel it. The solution – I finally switched to Chrome for everything browser related, which makes even more sense now that I’m using a Chromebook and an Android phone. My only non-Google technology is an iPad Mini and the Windows laptop, both of which will move to a Google platform when it’s time to replace them. 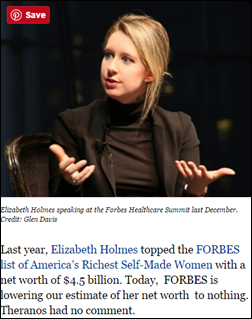 Forbes revises its estimate of the net worth of Theranos founder Elizabeth Holmes from $4.5 billion to zero. An ONC study finds that 84 percent of US hospitals are using at least a Basic EHR, a nine-fold increase since HITECH’s adoption in 2009. DrFirst acquires Meditech-focused consulting firm The IN Group. CHIME awards $30,000 each to the two finalists in the concept round of its national patient ID challenge, with those contestants moving to the final $1 million round. Allscripts caves in to a proxy fight and adds three new board members advocated by key shareholder HealthCor Partners, which had publicly called for Allscripts to fire CEO Glen Tullman. Three-fourths of respondents to my poll disagree with Neal Patterson’s assertion that Cerner and Epic will end up being the only hospital EHR survivors. Fired HCA doctors say the hospital chain hired huge numbers of physicians to prepare for an ACO environment, then terminated those whose practices weren’t profitable. A research article finds that few hospitals are using bedside barcode-checking of medications and that nurses bypass those systems frequently. An article describing problems with Kaiser Permanente’s shuttered kidney transplant program blames information management problems and its paper-based systems. A rumor suggests that Misys is trying to sell its hospital systems. Former National Coordinator David Brailer launches the $700 million private equity fund Health Evolution Partners. MED3OOO takes a majority ownership position in InteGreat. Last week’s results: job promotion factors. This week’s survey: what is the role of the person you most value as a mentor and/or professional peer, how did you connect with them, and how do you maintain the relationship? The Wall Street Journal notes that uncertainty surrounding the Affordable Care Act has forced some health IT startups to change their strategies. Five hospitals in Australia experience an IT incident cause by applying security patches to protect against WannaCry ransomware. Apple acquires sleep monitoring sensor and app vendor Beddit. The Congressional Budget Office estimates that the Affordable Health Care Act would increase the number of uninsured Americans by 23 million by 2026 in reducing the deficit by $119 billion. The Bipartisan Policy Center calls for private-public efforts to improve health IT safety, but does not mention ONC’s proposed EHR safety center. The director of Denmark’s equivalent of the FDA warns that big US tech companies like Google and Apple are rolling out health apps without demonstrating their efficacy and safety and that those companies are gaining permanent access to patient data. The local paper says that Erie County Medical Center’s ransomware infection is still affecting the hospital six weeks after the hospital decided not to pay the demanded $44,000 ransom, also running a screenshot provided by a hospital employee that suggests that the culprit was Samas, the same malware that took down MedStar Health in 2016. 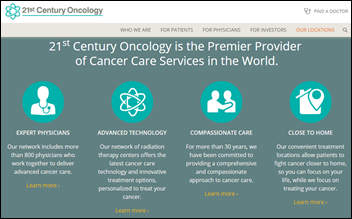 Debt-ridden Florida-based clinic operator 21st Century Oncology – which was breached by hackers in 2016 in exposing the records of 2.2 million patients and resulting in at least 13 federal class action lawsuits – files Chapter 11 bankruptcy. As companies tend to do, 21st Century calls the bankruptcy a “positive development,” brags that it is “fundamentally strong and profitable,” and claims that “very little, if anything, should change during the Chapter 11 process,” calling into question either the credibility of the company or of the US bankruptcy process that is often used as a shrewd corporate strategy to legally screw employees and creditors for the benefit of executives. Fitzgibbon Hospital (MO) will replace Meditech and GE Healthcare with Cerner in November 2017. Pinnacle Hospital (IN) will go live with Prognosis Innovation Healthcare in June 2017. Illinois Valley Community Hospital (IL) will implement Athenahealth’s EHR in November 2017, replacing McKesson. Pioneers Medical Center (CO) will go live with Athenahealth in 2017. Riverside Tappahannock Hospital (VA) will replace Siemens with Epic in June 2017. 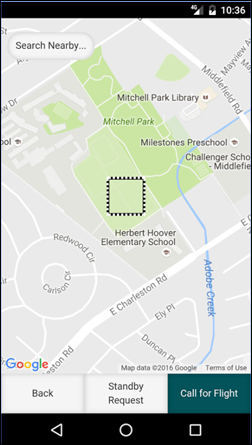 Vanderbilt LifeFlight develops an Uber-like app to allow first responders to request a helicopter, sending the service an the GPS coordinates and and requestor information while giving the emergency responder a real-time flight map and estimated arrival time. Healthcare regulation hinders rapid transformation. 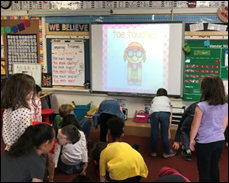 Entrenched players are huge and have their hands in multiple aspects of healthcare. Nobody cares about better-faster-cheaper in healthcare. There’s no ability to shop prices. The government is the biggest customer. Prior authorization seems like a very niche thing. It kind of is, but at the same time, it’s also right at the intersection where a doctor is making a decision about the tradeoffs between the cost of a treatment and its efficacy. We think that that’s a fundamental problem in healthcare. We have built both the network and the connectivity and then also the relationships with pharma, payers, pharmacies, and providers. We think we can help doctors make more intelligent consumption decisions. We think is a very large opportunity, starting with drug, but helping to get to more personalized medicine in terms of prescribing, and then also other procedures as well. Because of the growth of the size now, we have a lot of interest from the financial and strategic partners. We’re always willing to listen. We think this is a very big standalone company on its own. He went down, under. 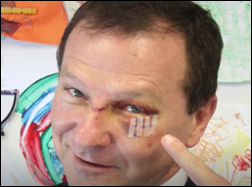 In Australia, a member of Parliament laughs so hard while watching the US TV show “Veep” that he chokes on his sushi, passes out, and stumbles through his house before falling face-down unconscious into his granite kitchen island, leaving him with a black eye, three stiches, and a get-well tweet from star Julia Louis-Dreyfus. QuadraMed, a Harris Healthcare company, will exhibit at the NYHIMA Annual Conference June 4-7 in Rochester. Salesforce announces strategic agreement with Dell Technologies. Solutionreach expands leadership team with new promotions. Summit Healthcare and Access will exhibit at the 2017 International MUSE Conference May 30-June 2 in Dallas. Love the contrast of Iodine and CoverMyMeds… and the different takes on whether we can use HIT to solve the 3 gambit problem of improving efficiency, quality and cost at the same time. Thomas Goetz is understandably pessimistic right now… but hope he keeps plowing away and listens hard to Matt Scantland’s advice: ““Start with a big problem and solve it not by disrupting anything, but by finding a way that everyone wins”. 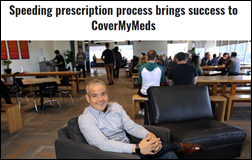 although I would add that CoverMyMeds did disrupt things, but did so in a positive way ((eg removing work from staff and docs – might mean you can fire some staff, but much more likely means they can do higher order things). It’s the same philosophy we’ve had with healthfinch from the start – how do we “automate and delegate” routine work to make life easier for physicians… because that can also result in better quality (quicker turn around times, more adherence to protocols) while saving time/money by freeing up physician and staff time. In other words, there are a LOT of opportunities to make healthcare better… both at the the patient level, and at the physician level… just need to make sure incentives are well aligned! Could someone provide a source for Thomas Goetz’s comments? I am wondering if Alberta will decide to go all in with Epic – the problems outlined in the report seem to be tailored for Epic to solve. Considering that the population of Alberta is just short of 4.5 million people, that is significantly lower than the number of patients Kaiser has in California. Goetz is not alone in the field of dead or dying healthcare start-ups that sought to transform, disrupt, do whatever to healthcare. But as Goetz learned and others will, this is a very difficult market to first understand, second identify what people are willing to pay for and lastly defining a path to market. In Goetz’s case, it was point two that tripped him up. Iodine was going after the patient engagement/education space, an area that has received little attention by providers (thus little $$$ spent) and one where the EHR incumbents have a stranglehold. I work at a 1000 bed hospital system using CommonWell and we pull 150 documents a day. That’s an average but that’s more than 60k so I think someone’s math at CommonWell is either bad or old.